Are you ready to team up with startups or corporates? Find out whether your startup is ready to collaborate with corporates, or is your corporate ready to tyeam up with startups? Benchmark your scores with many other corporates and startups and read about best practices using our Ready To Team Up survey tools . 'This is an essential reference for anyone interested in corporate venturing. It is full of helpful insights, and is illustrated with loads of great examples.' (Henry Chesbrough, professor at UC Berkeley and author of Open Innovation). 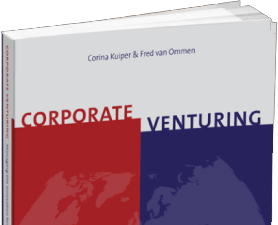 In this book Corina Kuiper and Fred van Ommen describe how Corporate Venturing is part of the company’s ‘innovation family’, where babies and teenagers are the new business initiatives and the parents and grandparents represent the established business.